My next teacher was Roger Pugh, pupil of George Malcom and assistant organist at Westminster Cathedral at the time. I met him in London after a srvice he played at St. james, Spanish Place, and when he later turned up in Oxford with George (for the recording of Haendel's Organ Concertos in Merton Chapel with Neville Mariner)it was agreed that I shoud take some lessons with him. So there came into existence a parenthesis in my Oxford training - taking lessons in London and playing at Westminster Cathedral. This was enormously exciting, being tested as organ student by playing during liturgies there! Roger was the opposite of Colin Mawby: non-systematic, charismatic, a minor genius, an improviser of enormous talents. Never have I heard the organ at the cathedral played as well as when Roger played it. The Willis organ and Roger submerged themselves in each other - they emerged as one person, unlike anything I have ever heared before. But the London experiences did not take place on a regular basis, alas, Roger was too busy for that to be possible. Accordingly I had to continue with Colin in Oxord, the two masters beeing complementory rather that rival intitutions in my life. We did have lessons in Christ Church occationally, on the old father Willis Organ that later has been replaced by a modern Rieger organ, this happened before Simon Preston left Oxford. All in all, the years in Oxford were perhaps the happiest in my life, not at least thanks to Colin. Britten's Missa Brevis is a remarkable piece, written in 1959 to mark the retirement of George Malcolm, director of Westminster Cathedral Choir. 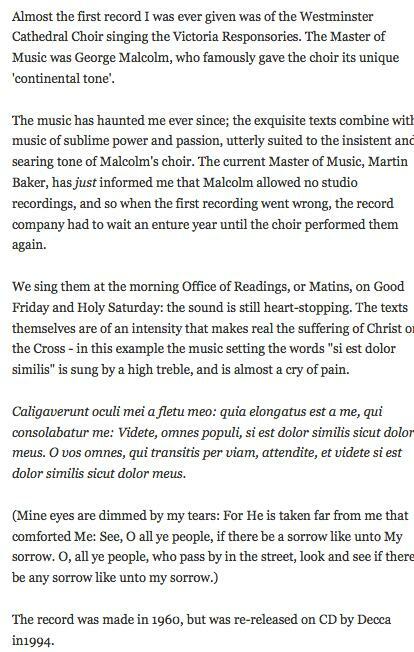 Britten was a long-time admirer of the continental, full-bodied sound that Malcolm had cultivated in the Westminster choristers, and the Missa Brevis provides ample opportunity to showcase the impressive abilities of Cathedral trebles. It opens with a commanding Kyrie and dance-like, syllabic Gloria, which - despite its vital rhythms and some almost jazz-like chordal progressions - is actually based on medieval plainsong. At the core of the work is the Sanctus, which opens with a full twelve-note row presented by three cleverly overlapping voice parts, highlighting Britten's growing interest in serialism at the time. In the Benedictus Britten takes the traditional approach in his choice to use soloists, but the staccato word-setting is very unusual. 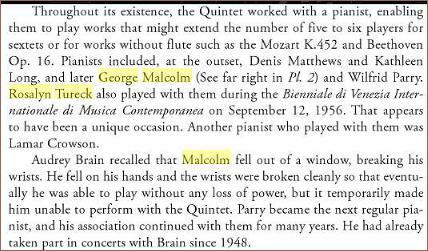 After the 1951 German trip the Dennis Brain Wind Quintet was joined by Wilfrid Parry, who now replaced George Malcolm as their regular pianist and accompanist. George had found it increasingly difficult to accomodate all his other musical activities to suit the Quintet's schedules: he nevertheless returned several times later to play with them. Wilfrid Parry had been Dennis's personal accompanist for recitals since 1948. On October 10th Manoug Parikian and George Malcolm gave the first of five sonata recitals, at which the violin sonatas of Mozart and Beethoven are to be played. These concerts are being given in the Recital Room at the Festival Hall, a rather unsatisfactory room that looks as though it had been designed as a restaurant rather than a concert-hall. Hearing is erratic, too, though I had a good enough place on this occasion to enjoy George Malcolm's wonderfully agile and accurate piano-playing. He is inclined to under-statement, certainly, as Beethoven's Op. 96 showed, but he is an unmistakeable musical 'character' as well as a fine technician. Manoug Parikian's position. as leader of the Philharmonia Orchestra is a guarantee of his technical skill and his musicianship; but, as before at a solo recital, I found his interpretation disappointingly colourless and an unexpected note of hesitancy in his playing. Jennifer Vyvyian was in the first recording of Cantata Academica, conducted by GM. Although that doesn’t seem to have been a happy experience. Her diary for 17 Mar 1961 reads: ‘record Ben’s new cantata for Oiseau Lyre for 25gns. No one seemed particularly grateful. Owen [Brannigan], Helen [Watts] and I went and drank gin to cheer ourselves up’. Harpsichordist Gerald Gifford writes: More years ago than I care to remember I won the RCM's harpsichord competition, which George adjudicated. We weren't given the adjudicator's written remarks or notes, though I did manage to inveigle sight of them through the kindness of the Registrar's Secretary. George was clearly amused by my initials and had memorably commented I had 'clearly come from a different stable to the rest'! The organist Nicholas Kynaston recalls that when George was preparing to record the complete Rameau keyboard works he went to France to consult a renowned Rameau expert on details of ornamentation. The advice given to George was not to prepare or practice ornamentation but just to improvise whatever came to him at the time! George's relations with the Cathedral authorities were never easy, most notably with the then administrator, Monsignor Collingswood. By the end of George's tenure they were only corresponding by mail! One day George found in a bookshop "Courtesy For Clerics", which, as he gleefully related to Nicholas Kynaston, he sent to Collingswood with great satisfaction. We recorded Brandenburg Concerto No. 3 on January 30, 1971. Bob [Robert Thurston Dart] looked grey and tired. On Monday he did not make the frequent journeys with us to the control room. On Tuesday he had a mattress by the harpsichord so that he could rest between ‘takes’. He played the continuo for the first movements of Concertos 2 and 4, and for the serene Adagio [from a Sonata in G, BWV 1021] used for the slow movement for No. 3. I put him into the car which took him to the clinic at 5.30 P.M. and saw him no more. His place in the 5th Brandenburg was taken by George Malcolm and the remaining continuo was split between Raymond Leppard and Colin Tilney (a student of Mary Potts). Although Dart had already recorded this concerto with the Philomusica – complete with a registered crescendo in the first movement cadenza! – it would have been interesting to see how his views had changed, more than 10 years later.